Dark energy could be one of three things. It could simply be a property of empty space itself. Einstein’s theory of gravity, known as general relativity, allows for just such a “cosmological constant” that would be aproperty of the vacuum and would stretch space. Or, in a radically different alternative, dark energy could be a new type of force field that occupies space, much as air fills a balloon. That second alternative is known as “quintessence.” Finally, dark energy could be an illusion, a sign that scientists’ understanding of gravity as encapsulated in general relativity isn’t quite right. 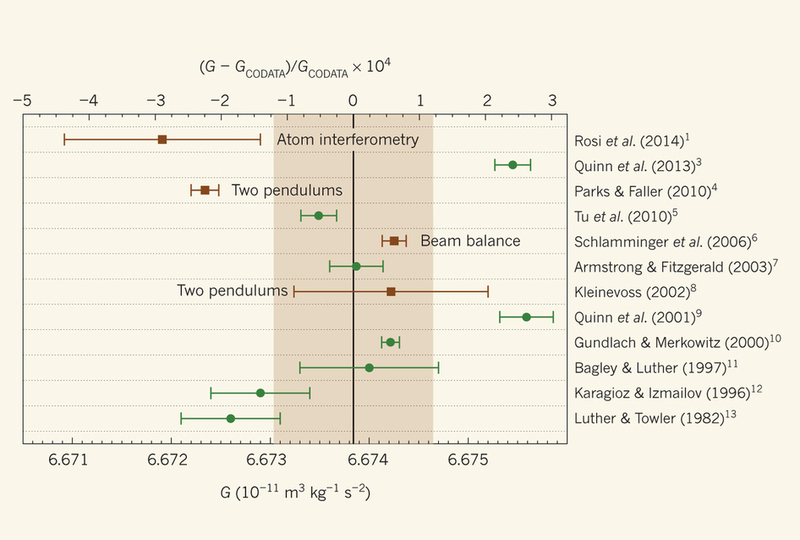 Published resultsof measurements of the gravitational constant, G, over the past 32years. The solid circles denote measurements that employed torsion balances.The three lower solid squares show results that were obtained using a beambalance or two pendulums. The upper solid square is the result obtained by Rosiand colleagues1 usingthe technique of atom interferometry. The shaded area denotes the one-standard-deviationconfidence interval of the value from the 2010 CODATA compilation of physicalconstants18. Cho A. What is dark energy? [J]. Science, 2012, 336(6085): 1090-1091. Hogan J. Welcome to the dark side [J]. Nature, 2007, 448(7151): 240-245. Hand E. Survey tunes in to dark energy [J]. Nature, 2012, 481(7379): 10-11. LI Miao, LI Xiao-Dong, WANG Shuang, WANG Yi. Darkenergy [J]. Communications in TheoreticalPhysics, 2011, 56(3): 525–604. Vikhlinin A. Studies of dark energy with x-rayobservatories [J]. Proceedings of the National Academyof Sciences of the United States of America, 2010, 107(16): 7179-7183. Weinberg S. Anthropic bound on the cosmologicalconstant [J]. Physics Review Letters,1987, 59 (22): 2607-2610. Van Flandern T C. Is gravity getting weaker?[J]. Scientific American, 1976,234(2): 44-59. 杨正瓴.基础课的精华性[J]. 高教研究与探索, 1997, (2): 34-36. Williams E R, Faller J E, Hill H A. Newexperimental test of Coulomb's law: a laboratory upper limit on the photon restmass [J]. Physics Review Letters,1971, 26(12): 721-724. Mohr P J, Taylor B N, Newell D B. CODATArecommended values of the fundamental physical constants: 2006 [J]. Reviews of ModernPhysics, 2008, 80(2): 633-730. Chiba T. The constancy of the constants of nature:Updates [J]. Progress of TheoreticalPhysics, 2011, 126(6): 993-1019. Parks H V, Faller J E. Simple pendulumdetermination of the gravitational constant [J]. Physics Review Letters, 2010, 105(11): 110801. Quinn T, Parks H, Speake C, Davis R. Improveddetermination of G using two methods [J]. PhysicalReview Letters, 2013, 111(10): 101102. Pitjeva E V, Pitjev N P. Changes in the Sun'smass and gravitational constant estimated using modern observations of planetsand spacecraft [J]. Solar System Research,2012, 6(1): 78-87. Kapner D J, Cook T S, Adelberger E G, et al. Testsof the gravitational inverse-square law below the dark-energy length scale [J].Physics Review Letters, 2007, 98 (2):021101. Speake C. Gravity passes a little test [J]. Nature, 2007, 446 (7131): 31-32.